The filioque doctrine, espoused by Western Christians, has its source from Augustine of Hippo (359 - 432 AD). Augustine had a fertile imagination, who could not shake off the Platonic influence of his youth. The doctrine of a 'double procession of the Holy Spirit' was first adopted in the West at the Synod of Toledo (447 AD), which appears to have followed Augustine's teachings. This addition was forbidden by the Fourth Ecumenical Council (451 AD). Here is the origin of the problem that was to agitate the Church for a thousand years. Contentions that the filioque has Biblical foundations have yet to be demonstrated. St. Photios was forced to become Patriarch of Constantinople, however he took his calling seriously and at once set to work as a man of God. One of his activities was to correct the error of pope Nicholas of Rome who enslaved the people of the West with threats of condemnation to hell for disobedience to the pope. 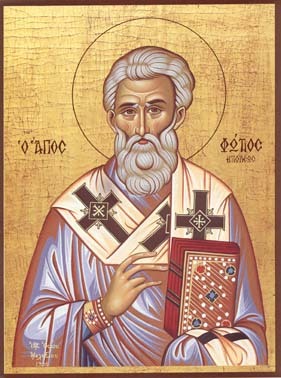 Holy Photios wrote to Nicholas "Nothing is dearer that the Truth". In the same letter he noted "It is truly necessary that we observe all things, but above all, that which pertains to matters of Faith, in which but a small deviation represents a deadly sin". As a Father of the Church, St. Photios was also known for his brilliance and for his missionary zeal. He blessed St Cyril in his work of developing an alphabet for the Slavonic people, and for the later work of St Cyril and his brother St Methodios as missionaries to the Slavonic people. St. Photios reposed in the Lord in 891 AD, and his feast day is celebrated on February 6. The life of St Photios is available in the French language here.